Live Sound Engineer | Chicago, IL - B & B Productions, Inc. 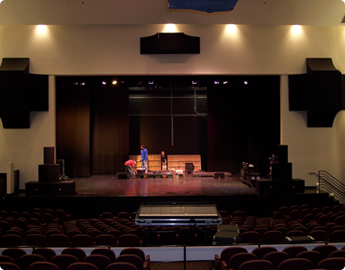 Since 1994, B&B Productions, Inc., has been your one-stop shop for live sound reinforcement. From large festivals and corporate events to the smallest clubs and private parties, we provide that touch of professionalism that will make your next event look and sound incredible. 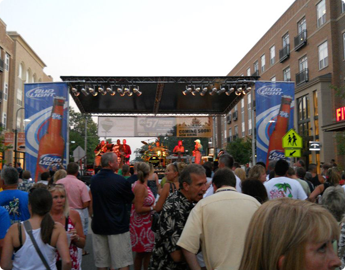 We can handle everything from stage lighting to setting up a protective stage canopy. B&B Productions owns top-quality, well-maintained equipment and staffs only knowledgeable, well-groomed individuals who will positively represent your organization. We place a strong emphasis on advanced planning to ensure that everything runs smoothly at your event. We can set up an outdoor movie or provide skilled mobile recording as well as a generator. If you're in need of professional staging, lighting, and sound services for a festival or live event, contact B&B Productions in Woodstock, Illinois. Having worked with top national, regional, and local acts, no situation is too large or too small for us. If you require entertainment production services operated by experienced professionals at an affordable price, B&B Productions will exceed your expectations. We are always punctual, and we staff technicians with electrical backgrounds who are very experienced when it comes to troubleshooting problems that may arise. Our owner went from providing the entertainment to being the engineer behind the entertainment. Having been on both sides of the stage, he knows exactly what goes into presenting a great performance. Our company is in tune with success, making sure that everything goes well — from the initial design to the execution. All of our staff members are truly passionate about their work, and we take great pride in the execution of our events and designs. B&B Productions has established dealerships with a lot of the products that we use so that we are able to get the top products that you might not otherwise have access to. As experienced live sound engineers, we have everything that a band needs to look and sound great. Contact us for more information. Saturday & Sunday, 10:00 a.m. - 5:00 p.m.